If Time magazine did such things, surely its 2007 “person” of the year would be a widget. Lemonade is just one of the latest services offering sales tools for your Facebook or MySpace pages. 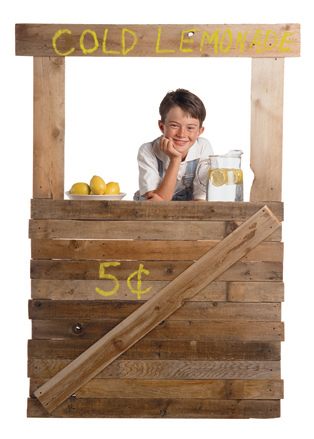 Its Lemonade “stand” – a product sales widget – is easy to set up. Go to Lemonade.com, register and begin building your stand by adding a few custom touches to its appearance and selecting items you want to sell from its product catalog. (The catalog currently has about 2 million products from a variety o vendors.) The last step is to enter the URL of your Facebook or MySpace profile page and within minutes, your Lemonade stand appears and is ready for business. The interface is pretty simple. The Lemonade widget is designed to look something like an iPod or mobile phone. It has a small screen with forward and back buttons. Users can click through the products you have on offer in slideshow fashion. They can view a short product description and then click through to the vendor’s website if they want to place an order. Lemonade works on the affiliate approach. Companies pay the affiliate 5 – 15 percent commissions on every sale made via their stand. Lemonade keeps 20% of the commission as a fee for the stand and the interface to the merchandise vendors. The downside right now for would be micro bookseller moguls is its book category of products has an extremely limited selection. But the potential is there. The stand is easy to create and add to a page. With a more substantial book collection, it could provide a great way to market titles to “friends.” Authors could include their titles with related, but not necessarily competitive, works. It is essentially Amazon’s Listmania in a widget that can travel. Widgets are currently available and more are being created that tap into the Amazon catalog. A number of these can be downloaded from Widgipedia and WidgetBox. Many of the widgets work off of the author’s associate’s program ID, so you can get a referral fee on any sales made. Unfortunately, most o these widgets do not run on the major social networking sites. A union between a simple Lemonade interface tied in with major social networking services and the Amazon widgets’ access to the world’s greatest book catalog is a marriage made in bookselling heaven. Lemonade and the army of Amazon widgets are early examples of how the bookselling space will expand to include any place where a widget can live. Like biological microbes colonizing every conceivable environment, widgets will likely adapt to almost any niche on the web. This entry was posted in author tools, book marketing, readership strategies. Bookmark the permalink. it’s definitely true that those social networks become more and more popular and a large potential marketing place for commercials. should be some rules to regulate it!! !